There are hungry dogs… and then there is Norman! 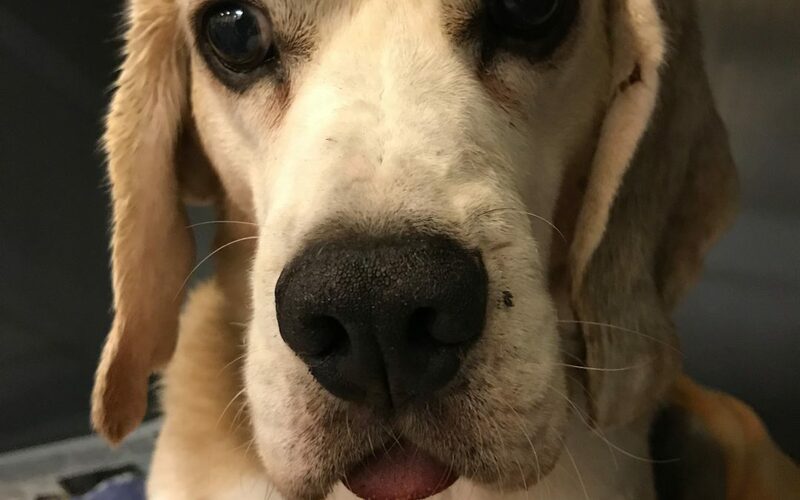 While on his daily morning beach walk, this 9-year-old Beagle got a nasty surprise trying to snack on a crayfish, after a barbed antenna impaled his mouth. Not so tasty after all! His owner Diana originally attempted to remove the stick which was protruding out the front of his mouth – but it was not budging. This was a blessing in disguise as removing the obstruction could have caused significant bleeding. Being too early in the morning to visit their regular vet, Diana raced Norman to Perth Vet Emergency. Dr Hayley Craft immediately took x-rays which showed the crayfish tentacle lodged from the oral cavity all the way to the larynx causing a large amount of bleeding and extreme oral pain. After sedation and a pharyngeal exam was performed it uncovered the crayfish antenna was stuck under the right side of his tongue deep into the throat tissue with barbs caught along the soft tissue. Thankfully Norman escaped any trauma to the pharynx or larynx, and radiographs confirmed there were no further pieces of antennae caught deeper in the oesophagus and stomach. General anaesthetic and a lengthy surgery were required to remove the antenna. The barbs had to be very gently removed from the surface of the tongue. Lucky for Norman only a small amount of tissue area required cutting into and the wound was closed with absorbable stitches. Norman was sent home with strict instructions to stay confined inside without bathing until the wound was properly healed. Chewing on hard objects like bones, dirt (or crayfish!) was also forbidden. When it comes to food, Beagles don’t muck around. They are the master canine opportunist! Beagles have different digestive systems to other dogs and humans, which makes them less able to control their appetite. Usually, energy is created shortly after we eat however Beagles digestion doesn’t start until the food reaches their stomach. This takes much longer for them to realise they are full after eating, sometimes up to a whopping 3 days after a meal! In turn, this makes them prone to overeating, wolfing down food like there’s none tomorrow, and landing them in sticky situations like poor Norman. Ensure your pooch stays up to date with their parasite treatments as this can also be a cause for overeating. 10 weeks later Norman came in for radiographs under a general anaesthetic. We are happy to report he is healing well and back to his normal self. Although he may think twice the next time he comes across a Crayfish.